THE KIDS: I love getting the opportunity to shoot with other kids, especially girls since I never really have a chance to style them. You may remember gorgeous Yamilah from this shoot. We had so much fun last time that we wanted to definitely work together when she was back in NYC. BEHIND THE SHOOT: I love shooting outdoors. I'm not much of a studio person, although I love that I finally have one my own since I bought a house! YAY! We did this shoot in and outdoors since I didn't want the kids to freeze, but I definitely wanted some bright and airy photos. THE STYLE: Loved styling Yamilah in a slight preppy but sporty look. Her shirt with the bow and the hat dressed her up a bit, but I made it more tween appropriate with the jeans, varsity jacket and converse! 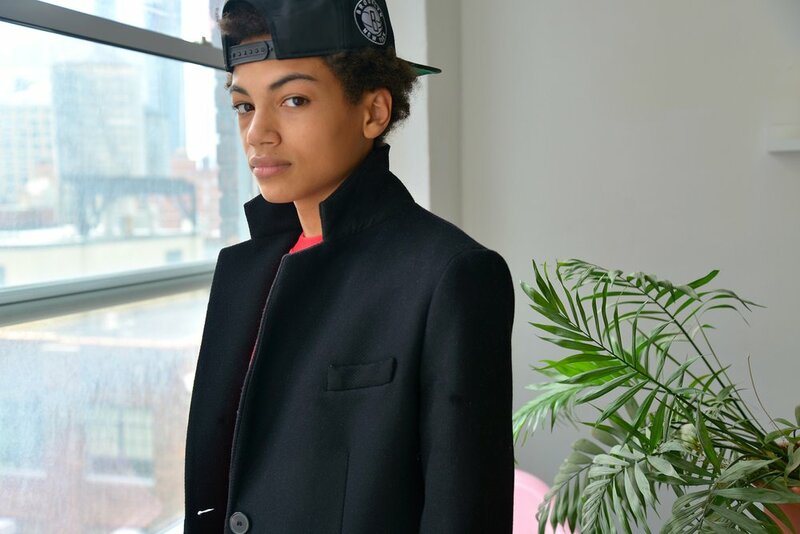 Tristin is a little sophisticated in this one with a long dress coat, but again, I took it down to kid level with a snap back cap and a sweatshirt. Tyler is a little rocker but cool with the jacket and hat. Both boys are rocking the latest Dr. Martens boots - stay tuned for a whole bunch of content on those! Make sure to check out Yamilah on Instagram! In this installment of Cool Kid Chronicles, we meet mini model and actress Yamilah! 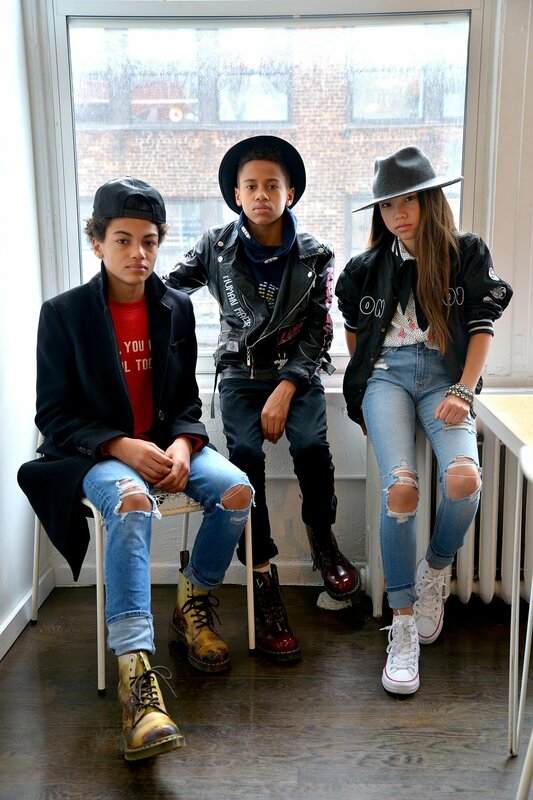 We took a trip to East Harlem and teamed up with the stylish site Junior Style London on this feature! Check out a few photos here, meet Yamilah in the interview below, and see the rest of the interview and more photos on Junior Style London here! So excited to do another feature of Cool Kid Chronicles! I love featuring kids working hard to follow their dreams! This feature is no exception!.Meet Madeleine Pace, not only is this 9 year old acting, dancing, modeling and tapping her way around town, she's appeared in shows like Saturday Night Live, Maya & Marty. What I love most about Maddie is that she has the most vibrant personality! You'd think a 9 year old working with two 13 year old boys would be shy, but no way! - this kid shines no matter what she does! Learn more about Madeleine below and make sure to follow her journey on Instagram! 1. Do you play any sports? Yes, I love to dance! I like to dance tap, jazz, hip hop, ballet, contemporary, lyrical and theatre dance. I also like to swim in the Summer. 2. How long have you been acting? I have been acting professionally since I was six years old. I'm turning ten at the end of May. On Broadway, I played the role of Ivanka in Once the Musical! It was so fun- I danced to Ej Pada Pada Roskica in the scene with my stage Mom, stage Grandma and some other characters! Ej Pada Pada is one of my favorite songs ever! When I was four and five years old I did some local theatre classes... There, I remember singing Seize The Day in a show and I also played a cheerleader in High School Musical. That same year I put together a Newsie outfit for my Halloween costume. 3. What do you love about acting? I love that I can express my feelings and words through dialogue that people wrote. I also love to become different characters. Just recently, I played an adult in a cabaret. It was fun to be an adult and sing about Kids with my friend (the song was from Bye Bye Birdie and is called "Kids"). 4. What's your favorite place to hang out in NYC? I love to hang out in the theatre district and the garment district. I love being around all the Broadway theaters and collecting Broadway cards at the Broadway store. I also like walking by the Jacobs Theatre. Walking by it reminds me of all the fun memories I had there. My dance studio is located in the garment district, so between dance classes, I love to search for fabric to use in my fashion designs. 5. What do you want to be when you grow up? I want to be a dancer, singer, actor, fashion designer and songwriter! I think it would be fun to see how all of these different roles can be mixed together to become one awesome job! 6. If you could have one super power what would it be and why? The super power that i would like is to see the future so I can see what happens in my life and be prepared for it. 7. What apps are on your phone or ipad? Which is your fave? On my iPad I have Minecraft, the TV app, TKTS, Instragram, Musical.ly, and Bitmoji. My favorite apps are Musical.ly and Instragram because you can interact with the world and your friends. On Musical.ly you post videos of you singing or doing a comedy video. 8. What's your favorite emoji? My favorite emoji is the nerd emoji:🤓 because it looks like a nerd. I love being a nerd because i love to read! I also have black glasses which i love because my grandfather has the same pair! 10. What's your favorite subject in school? My favorite subjects in school are Math and Social Studies. Math is awesome because you can experiment with different numbers. I love Social Studies because you learn about History. For example, this year we wrote a report about an immigrant. I wrote about my Great Great Grandmother Mary Louise Borkowska! I learned so much📒! 11. If you could work with any actor/actress who would it be? I would pick Phillipa Soo because she is so inspirational and I would learn so much from her. For example, She is always so energetic in her performance and tells a story through her eyes, facial expressions and reactions. I just saw her in Amelie and she was terrific! Know a Cool Kid we should feature! Shoot us an email at HELLO@TRISTINANDTYLER.COM! TRISTIN: Diesel jacket, VIngino Jeans MIA: Full Forever 21 Outfit TYLER:Appaman coat, Vingino top and jeans. Cool Kid Chronicles is becoming my favorite features to shoot on this blog. Not only do I get to meet some really cool kids and their awesome family members -- the boys get to hang out with some of the nicest kiddos around! I also get to style girls which is something I rarely do that's always fun. Mia's entire outfit is from Forever 21. In this feature, meet model + dancer Mia Rose Morgan! Mia was a super trooper during this shoot -- not only did she rock that dress when was it freezing out, but she was focused the entire time and was super sweet. Learn more about Mia below and make sure to follow her on Instagram! Photography/Styling/Creative by: Tiffany Casanova - Do not post photos without permission. All photos are protected by Copyright. 1. Do you play any sports? Yes, I play basketball and softball, but dancing is my favorite thing to do. I have been modeling since I was 7. 3. What's your favorite place to hang out in NYC? My favorite shops are Mikey Likes It Ice Cream and The Bakery at 740 Bergen Street. Mikey Likes It Ice Cream on Avenue A names their ice cream flavors after singers, rappers or movies. The best ones are the Foxy Brown and the Ice Ice Baby. The Bakery on Bergen in Brooklyn has the best macaroons ever and the owner, Akim, is so nice. A model and an actress. Or a dance teacher. 5. If you could have one super power what would it be and why? I would love to fly. 6. What apps are on your phone? Which is your fave? 7. What's your favorite emoji? [I love] the dancing lady emoji. 8. What's your favorite Tristin + Tyler video? 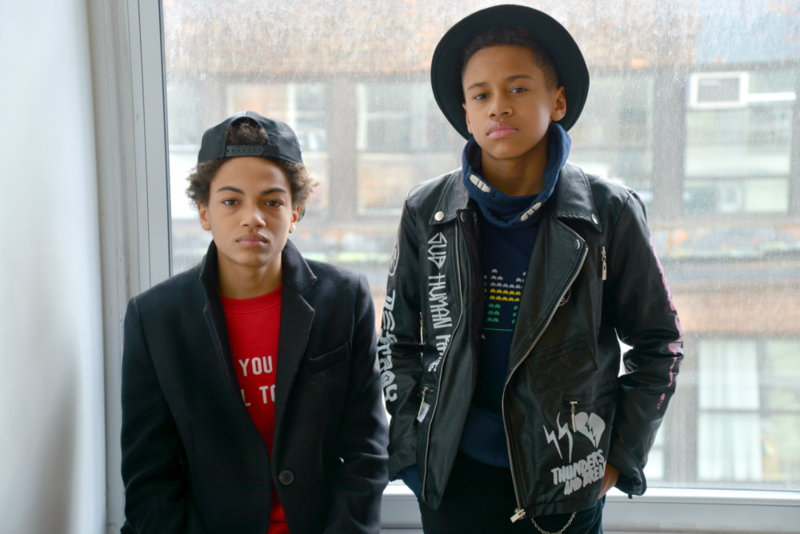 The Tristin and Tyler report from Petite Parade Kids Fashion Week, because that’s the first time I met them. 11. If you could only carry 2 things in your bag/backpack what would they be? 13. Who's your favorite music artist? Beyoncé again! LOL! 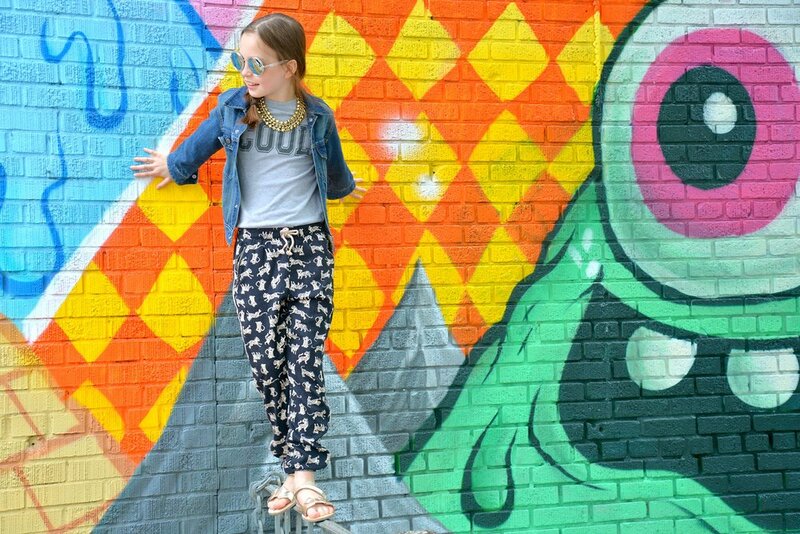 So excited to bring back our blog feature COOL KID CHRONICLES! We think kids are smart, determined and creative so we want to share their stories. Tristin + Tyler interview so many adults, it's time to hear from the kids! We began CKC back in 2014 and just did one feature, so we are so ready to start it up again! Learn more about Emilee below and be sure to follow her on Instagram: @emilee_madison! 1. Tell us what sports you play? I am a competitive swimmer. Ive been swimming since I was 4. I swim on three teams. I also play soccer and I used to be a competitive dancer but I had to give it up because there was not enough time to do it all. I like being part of a team because we work together and we are there for each other. Being part of a team builds a strong friendship with everyone. When i win it feels good to share it with everyone knowing we did out best as a group. 2. What do you love about modeling? I like modeling because I get to meet a lot of new friends and represent a lot of great brands. 3. How long have you been modeling? I started modeling when I was 4. For my first shoot I flew to Texas representing Servane Barrau. I became friends with Servane Barrau's daughter during that shoot, and we are still friends to this day. 4. What's your favorite place to hang out in NYC? I love New York City its my hometown. I'm such a city girl. Manhattan is my favorite place to hang out. My favorite places are the top of the Freedom Tower and the Museum of Natural History. 5. What do you want to be when you grow up? When I grow up I want to be an engineer or a doctor. 6. If you could have one super power what would it be and why? If I could have one super power, it would be to create my own powers. That way I could use whatever power was needed to help in any situation. 7. What apps are on your phone? Which is your favorite? The apps on my phone are Instagram, Snapchat, YouTube, Oovoo, Color Switch, iBooks and more. My fave is Snapchat because I can keep in touch, make streaks and have a story to tell what I'm doing. I also love playing with the filters. 8. What's your favorite emoji? My favorite emojis are the dog, the person swimming and the devil. 9. What's your favorite Tristin + Tyler video? I love all of Tristin and Tyler's videos, especially the ones that deal with food. 10. What's your favorite subject in school? My favorite subjects are social studies, Robotics, lunch and PE. Know a kid that should featured on COOL KID CHRONICLES? Let me know in the comments below or shoot us an email at Hello@tristinandtyler.com!